Sometimes it’s nice to kind of stray from the typical quilts that one might see on a day to day basis. Don’t get us wrong, all of the quilts using triangles are amazing, but there are a lot of them out there! 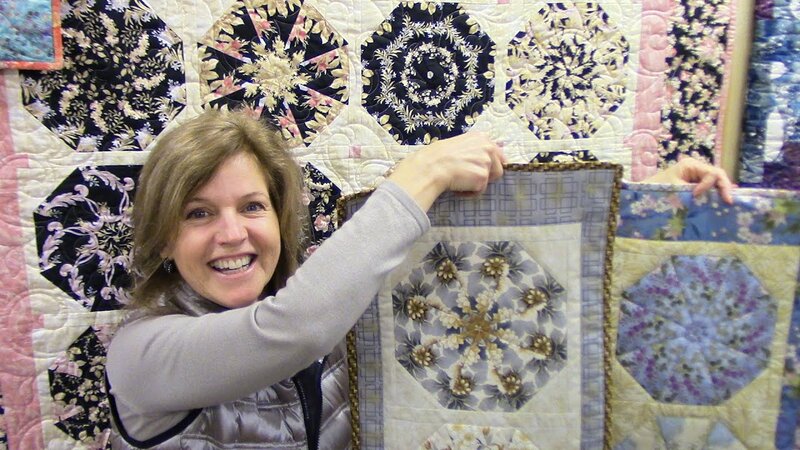 Sometimes it’s nice to use different shapes on our quilts to provide a different look. We have an amazing tutorial today by Donna and Matt from Jordan Fabrics about the kaleidoscope quilt and table runner block! They show us how this very same block can easily be transferred from a quilt block to a table runner block! And the pattern looks great on either one! The block design itself is very unique because the pieces are octagon shape rather then what we traditional see with triangles. They use busier fabrics to make the focal point in the quilt and it has a really cool affect. It definitely lives up to its name because it truly does resemble a kaleidoscope. The thing about this quilt is that it comes with a little more work than we see with a typical quilt. As Donna says, it’s difficult to cut the fabric into the different pieces used in the quilt. Lucky for us, Matt has the cutting technique down to a science and so generously walks us through the process in this tutorial. For any beginners out there, this one is a tad more difficult, but it can be accomplished with the video as a guide. There are also a couple of tools that will make this project a little easier. If you’re interested in purchasing the tools, you can find the link for more information in their video description. This project is so different and definitely worth the challenge. Don’t forget to check out the video below for the help.